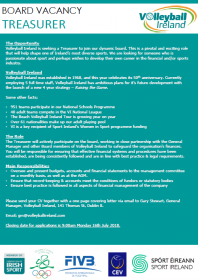 Volleyball Ireland is seeking a Treasurer to join our dynamic board. This is a pivotal and exciting role that will help shape one of Ireland’s most diverse sports. We are looking for someone who is passionate about sport and perhaps wishes to develop their own career in the financial and/or sports industry. Volleyball Ireland was established in 1968, and this year celebrates its 50th anniversary. Currently employing 5 full time staff, Volleyball Ireland has ambitious plans for it’s future development with the launch of a new 4 year strategy – Raising the Game. The Treasurer will actively participate on the board, working in close partnership with the General Manager and other Board members of Volleyball Ireland to safeguard the organisation's finances. You will be responsible for ensuring that effective financial systems and procedures have been established, are being consistently followed and are in line with best practice & legal requirements. Oversee and present budgets, accounts and financial statements to the management committee on a monthly basis, as well as at the AGM. Please send your CV together with a one page covering letter via email to Gary Stewart, General Manager, Volleyball Ireland, 141 Thomas St, Dublin 8. Closing date for applications is 9:00am Monday 16th July 2018.